We’ve had a few peeks at Spring around here in Seattle lately, but we all know that it’s not even near time to put away the comfort food recipes. This one is fortunately not THAT bad… after all, it’s all veggies! When we are short-ish on time or too lazy to come up with a full meal, we like to make fancy grilled cheese sandwiches in our house. Basically that just means sauteing or roasting some veggies or using up some leftover meat from the fridge and putting it into a grilled cheese sandwich. Easy-cheesy! We like to get all fancy like with our grilled cheese round here y’all! Preheat oven to 400 degrees F. Line a roasting pan with aluminum foil. Melt a pat (Tb. or so) of butter into a saute pan over Medium Low heat. Throw the diced onions into the melted butter and stir to coat. Cook slowly until caramelized. Once caramelized, pour the balsamic vinegar in and stir to coat. The vinegar will reduce and further caramelize the onions. Put the small cauliflower florets on one side of the foil lined pan. Drizzle with olive oil, celery salt, garlic powder (or fresh garlic, not garlic salt) dried rosemary and ground pepper. Rub olive oil all over the red bell pepper and place on the other side of the foil lined fan place. Place pan in oven and check every few minutes. Once the pepper starts to get charred flip it over so the other sides get charred as well. Flip the cauliflower so it gets a good roast on all sides. Once the cauliflower and peppers are done pull the pan out of the oven. Place the pepper into a paper bag and fold it shut. Let the pepper sit in the bag for about 5 minutes to sweat – this will loosen the charred skin so you can easily remove it. After you have removed the skin, cut the pepper into thirds. Slice your bread and cheese (if necessary). Butter the bread and sprinkle with garlic powder. Heat up a frying pan on low heat. Once your pan is heated place your bread with the buttered side down. 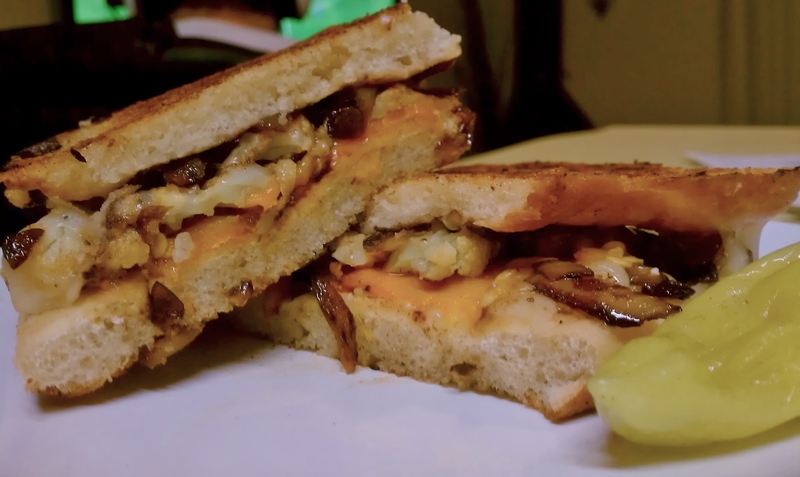 Spread on the caramelized onions and then layer with mozzarella cheese, roasted cauliflower, feta, roasted bell pepper, more mozzarella cheese and then top with the other piece of bread with the buttered side facing up. Press the sandwich down with a spatula and cook on a low temp for a few minutes until the bread is golden brown, then carefully flip the sandwich over and continue cooking until the cheese is ooey-gooey. Posted in Affordable Eats, Weeknight Dinners and tagged balsamic caramelized onions, balsamic vinegar, butter, caramelized onions, cauliflower florets, Cheese sandwich, comfort food recipes, dinner, feta cheese, food, grilled cheese, grilled cheese sandwich, grilled cheese sandwiches, grilled sandwich, home cooking, meatless, Meatless Monday, Meatless Monday cooking, Meatless Monday dish, Meatless Monday recipe, mediterranean, roasted cauliflower, roasted red peppers, roasted veggies, rosemary, toasted sandwich, vegetarian, vegetarian grilled cheese, weeknight dinners. Bookmark the permalink.